At the height of North Korea’s torrid run of nuclear and missile tests last year, I was constantly joking with my Associated Press colleague Kim Hyung-jin about how we could be writing about something entirely different once the calendar turns to 2018. North Korea was being unusually provocative, and its nuclear threats had become genuine. There was also a new president in Washington who seemed serious about using military force against the North, even at the risk of triggering a full-blown war. Each story we wrote seemed more doom and gloom than the previous one. Still, I kept in mind that inter-Korean relations have always been characterized by wild swings. Plus, South Korea’s Winter Olympics in February looked to be an easy opportunity for Pyongyang to reach out to the world while carefully crafting ways to explore nukes as diplomatic leverage. Perhaps by spring, we’ll be filing stories on reunions of war-separated families, Hyung-jin would say. We had no idea how right we’d turn out to be. The past few months have been a blur, with things moving forward faster than anyone could have imagined, often leaving us catching our breath and struggling to understand what it all means. North Korea flooded the Pyeongchang Olympics with hundreds of people, including the photogenic sister of leader Kim Jong-un, who conveyed her brother’s desire for a summit with South Korea’s president. And there he was on Friday, the young and brash leader in a Mao suit, beaming and grasping the hands of gray-haired South Korean President Moon Jae-in as the two strode over a cracked concrete slab marking the Koreas’ border. It was stunning to watch Kim appear from a building on the northern side of the Panmunjom truce village before trotting down the stairs and then toward the Military Demarcation Line as his entourage parted like the Red Sea before Moses. Hundreds of reporters sequestered at a media center well away from Panmunjom erupted in cheers and claps as jumbo television screens showed the moment Kim and Moon met. I could tell many of the South Korean reporters were getting goose bumps. I wasn’t one of them. I actually couldn’t tell what I was feeling, or how I should feel, about a significant event that could potentially change the future for millions, including me and my family, for better or worse. My biggest pride as a South Korean has always been that we shed our own blood to win democracy from brutal military dictatorships that ruled the country from the 1960s to the '80s. I never learned to romanticize about a shared statehood with what now seems to be one of history’s worst examples of dictatorships. I’ve never been able to emotionally relate with South Korea’s nationalistic left, which continues to treat North Korea like a troubled child with a golden heart, as much as I can’t relate with the nationalistic right, which spews hatred toward Pyongyang but glorifies our own dictatorships of the past. 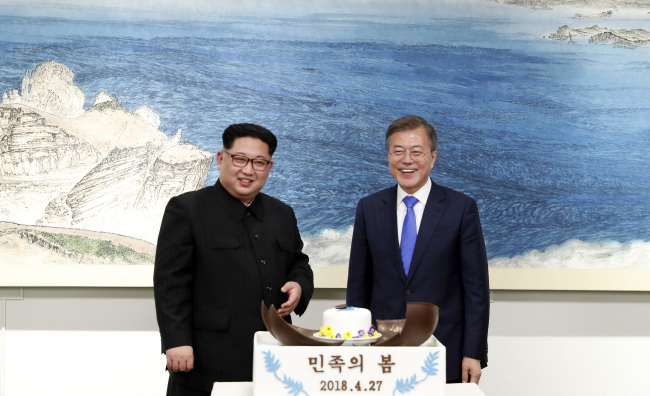 So I couldn’t get overly excited about the broad smiles, raised hands and ambitious but predictable talks between Kim and Moon about a permanent peace and unification that has evaded the rivals for decades. Their pledge on the “complete denuclearization” of the Korean Peninsula felt vague without any reference to verification or timetables. I had felt fuzzier during the first inter-Korean summits of 2000 and 2007, which involved Kim’s father, Kim Jong-il. But those were when North Korea’s nuclear threat was nascent. It was a bit easier to cut a sympathetic figure out of Kim Jong-il, a micromanaging dictator who struggled to overcome decades of economic failures and a devastating famine, all while it became impossible for his people to ignore that the North had decisively lost the inter-Korean competition. Kim Jong-un is decidedly more charismatic than his father and has shown a brutal side while consolidating power. For all its riches, South Korea has no clear way to counter the leverage Kim has with his nukes. To me, the summit felt like a cheerful and highly orchestrated reality show, full of dramatic entrances and exits, pop music and video art. It ended up with a deal but no new concrete measures on the nuclear standoff. The more substantial discussions on the North’s denuclearization -- including what, when and how it would occur -- were always going to be between Kim and President Donald Trump, who could meet in May or June. That said, South Korea had every reason to meticulously plan the inter-Korean summit as a setup to the Kim-Trump talks. Moon has always preached that Seoul should be in the “driver’s seat” when dealing with the North. His message hit closer to the hearts of South Koreans last year when the North’s weapons tests and Trump’s bombastic tweets triggered war fears. When you’re a descendant of a war refugee, you’re taught to appreciate the value of peace. I owe my existence to the late Lee Young-hee, a brave woman from the North Korean coastal town of Haeju, who boarded a crowded boat with her two infant sons on a dangerous nighttime escape to the South months after the Korean War broke out in 1950. My grandmother used to tell me about how the night boats refused young children out of fear that they might cry and give away the escape attempt. Crews often forced women to throw their babies into the sea, she said. She was allowed on board only after she drugged her own sons, maybe with opium, and showed the crew they had completely passed out. I never forget what my grandmother did for my family -- or the country she was so desperate to escape from. It remains to be seen if Moon is employing the best approach for peace. But I sure hope he’s right.